Bugs, spiders and rodents rank high on the list of worries plaguing many homeowners. While most pests are more creepy than dangerous, some pose a threat to your family's health and safety. Keep insect, mouse, rat and spider infestations at bay year-round with these pest-prevention tips from All-Pro Pest Control in Seattle, WA. 1. Clear away clutter. Rodents often nest in piles of clutter or boxes filled with clothing and other items. The potentially aggressive hobo spider and other arachnids tend to hide out in dark, cluttered spaces like closets littered with piles of dirty clothes. 2. Get rid of cardboard boxes. Inspect all boxes for pests before bringing them inside, since this is how many unsuspecting homeowners transport cockroaches into their houses. And these filthy bugs leave behind secretions that can attract other cockroaches. Cardboard is also an excellent food source for termites and silverfish. Mice use it to build nests. 3. Store all food in the refrigerator or in tightly sealed containers. Ants and other pests are attracted to spills and food kept in open containers. Cardboard boxes of food staples like cereal are no match for roaches and other cardboard-gnawing pests, so consider investing in airtight food-storage containers. 4. Keep your gutters clean. During the warmer months, mosquitoes are attracted to moist piles of debris inside gutters, which make excellent breeding grounds. You'll also find these disease-carrying pests buzzing around standing pools of water near the downspouts of poorly maintained gutters. 5. Thoroughly inspect your home's walls and entryways for gaps, cracks and holes. Bugs and spiders aren't the only pests that can get in through small crevices around doors, windows and foundations. Rats can squeeze through quarter-sized holes, and mice can enter through dime-sized gaps. Caulk these areas, or fill with steel wool, as rodents can't chew their way through these materials. 6. Store firewood as far away from the house as possible to minimize the possibility of wood-boring insects tunneling into your home. Burn wood immediately after bringing it inside to prevent infestations; shake or brush it off first for added security. And if you buy retail firewood that's crossed state lines versus buying locally, you run the risk of introducing invasive new pest species into the area. 7. If you're an arachnophobe -- or just don't like the idea of multi-legged creepy-crawlers roaming freely in your home -- call on pest pros like the team at All-Pro Pest Control. Spiders feast on insects inside the home, so starve them out by eliminating bug infestations. If your attempts at preventing pests in the home have failed, call for professional pest prevention and treatments. 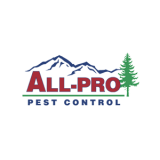 All-Pro Pest Control serves customers in Seattle and other Washington communities.